Pumpkin lends color and nutrients to this creamy Chili Mexicana. Onion, chile peppers, chicken and kidney beans seasoned with cumin and chili powder make a zesty and flavorful dish. Pumpkin is used in Indian cooking extensively. Pumpkin can be cooked in hundreds of ways. Pumpkins are used to make desserts in India. More on these recipes at a later date. Try the following recipe for a cold winter evening. It is sure to keep you warm and cosy. 1. Heat vegetable oil in large saucepan over medium-high heat. 2. Add onion, bell pepper and garlic; cook, stirring 5 to 7 minutes or until tender. 3. Add turkey; cook until browned. Drain. 4. 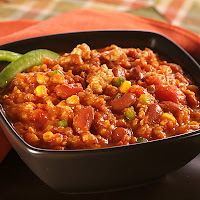 Add tomatoes with juice, pumpkin, tomato sauce, beans chiles, corn, chili powder, cumin, salt and pepper. 5. Reduce heat to low. 6. Cover; cook, stirring occasionally for 30 minutes.